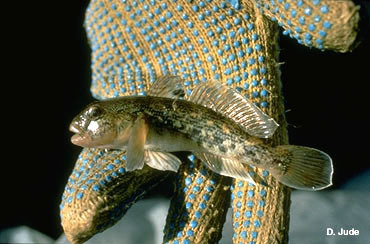 Round gobies originated in the Black and Caspian Seas. They were introduced into the Great Lakes by ballast water discharges from ships and were first discovered in 1990 along the St. Clair River (a Canadian river north of Detroit). Since then, gobies have been found in eastern and southern Lake Erie, southern Lake Huron, southern Lake Michigan, and western Lake Superior. Round gobies are a threat because of they are capable of rapid population growth after they reach new areas. They have shown the ability to out-compete native fish for food and habitat because of their aggressiveness, ability to survive in poor water quality conditions, ability to feed in complete darkness, and long spawning period (April through September). They are also known to prey on the eggs of lake trout. It is extremely important for anglers, commercial fishermen, and fishery professionals to know how to identify the round goby. Often, anglers are the first to discover round gobies because these aggressive fish are commonly caught by hook and line. Your help is vital to prevent the spread of this aggressive invasive species. Round goby have a single, scallop-shaped pelvic fin as shown here. 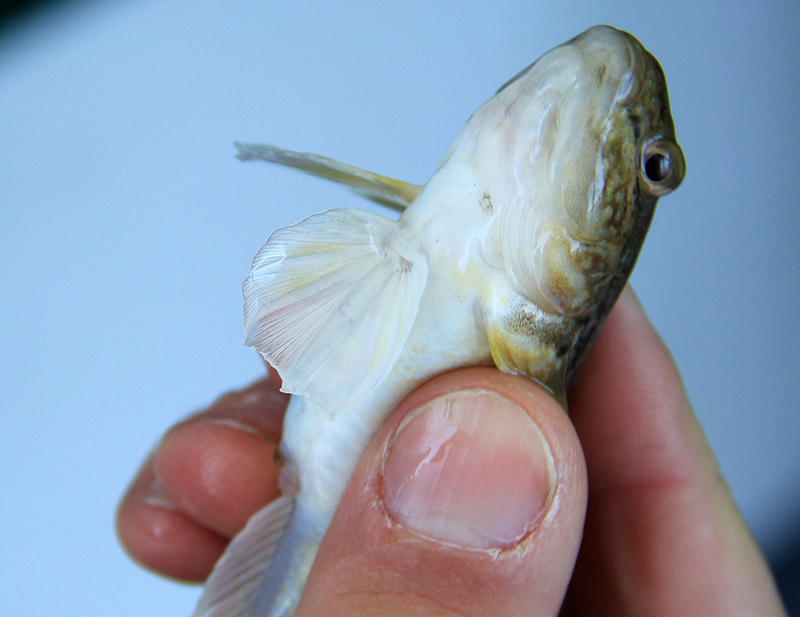 Sculpin have separated pelvic fins. Report sightings of round goby to Tip of the Mitt Watershed Council by calling (231) 347-1181 or by e-mail at info@watershedcouncil.org .